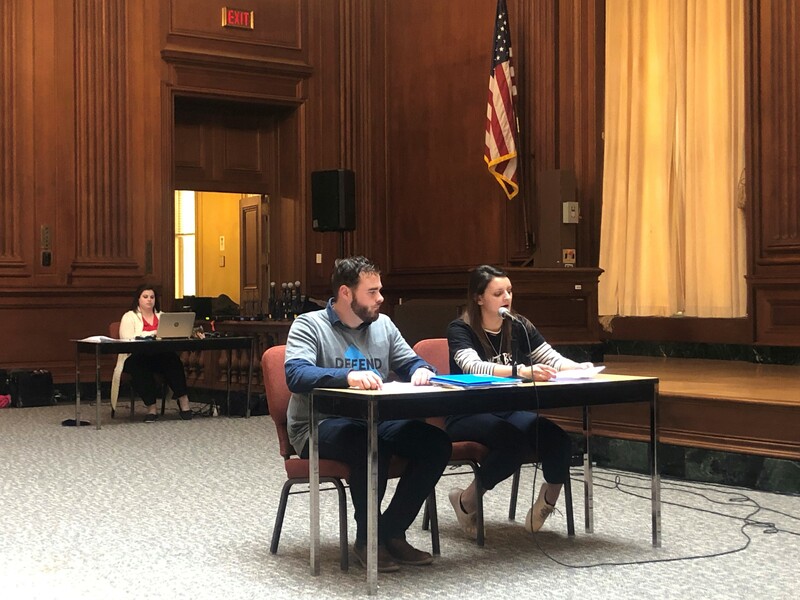 On March 18th, 2019, Defend Our Future Pennsylvania supporters testified against the Trump administration’s proposal to undermine the lifesaving Mercury and Air Toxics Standards at EPA headquarters in Washington, DC. Following their testimony, our supporters joined U.S. Senator Tom Carper (DE), Moms Clean Air Force, environmental justice leaders and others outside the EPA to urge Administrator Andrew Wheeler to reverse course on this dangerous proposal. The following are testimony from some of our supporters. 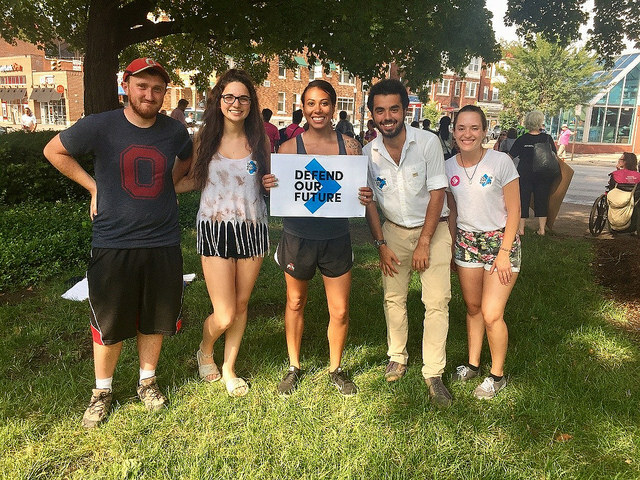 Good Afternoon, my name is Elayne Bodisch and I am the Pennsylvania Student Deputy Organizer for Defend Our Future. I am here to give testimony against the proposed rollback of the Mercury and Air Toxic Standards by the Trump Administration. Thus far, we have heard many expressive testimonies from those around the nation opposing this rollback. I am here to express feelings similar to these testimonies and represent other students throughout Temple University. 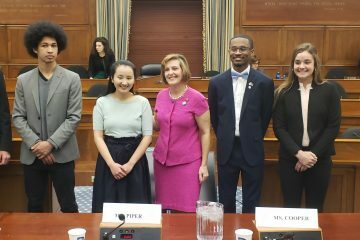 As a student leader at Temple, I am constantly opening up the conversation to student’s thoughts on issues around the nation, specifically climate change. And to no avail, students have expressed their concerns about the lack of action our public officials are taking to combat climate change. 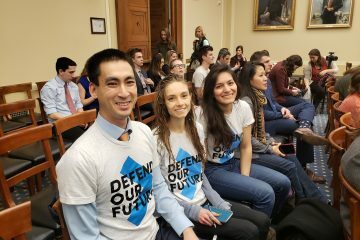 The threat of rolling back the Mercury and Air Toxic Standards has raised concerns and induced higher involvement in environmental advocacy on campus and throughout the nation. These standards, finalized in 2011, were put into place to protect our air and water from unnecessary exposure to mercury and other toxic pollutants emitted by power plants. These standards were and continue to be supported by a wide array of groups, including the power industry. Since 2011, we have seen the energy sector comply to these standards, investing $18 billion in cleaning up these dangerous and deadly pollutants and reducing the amount of mercury emissions by 80% nationwide, and by 91% in my home state of Pennsylvania. Personally, I support these standards because I see first hand the health benefits of reducing pollutants from our air and water. Now, I could stand here today and tell you stories about the difficulty I had growing up with asthma while living in coal country, and how these standards have protected me from the possibility of having an asthma attack. But instead I want to tell you about someone else, someone who can’t be here today to fight for himself–my father. My father is the most hardworking man that I have ever met. He has spent his whole life working so that he could give his children a life he believed we deserved. He was in the peak of his fitness in 2016 when I got the terrible call that my father had experienced a heart attack, although it was minor, he still needed surgery to place a stent. This news was devastating to my family, he was always the healthiest person, staying physically fit, eating well, and taking care of his mental health. Since his heart attack, my father has continued to take care of his body and his mind, but his cardiologist is still weary about future attacks. The MATS standards are estimated by the EPA to avoid nearly 5,000 heart attacks annually. Rolling back these standards would put my dad and others who have heart issues at a higher risk for heart attack and I refuse to stand by without doing anything. The rollback of the Mercury and Air Toxic Standards have detrimental health consequences for Americans and put money in the pockets of the elite in the coal industry. Frankly I am dumbfounded as to why these rollbacks are even being considered. The MATS standards work! The Trump Administration is abusing their role as leaders of the nation when they start to take away these rights of citizens. The right to clean air and a clean environment. I stand with everyone here today, those with heart touching stories and stone cold facts and for those who can’t make it today, to oppose the rollback of the Mercury and Air Toxic Standards. Breathing clean air is a right, we will not stop fighting until we achieve clean air and I demand our policymakers in Washington DC stand and fight with us. Good afternoon, my name is Francesca Johnson and I am the Vice President of the Drexel University chapter of Defend Our Future. 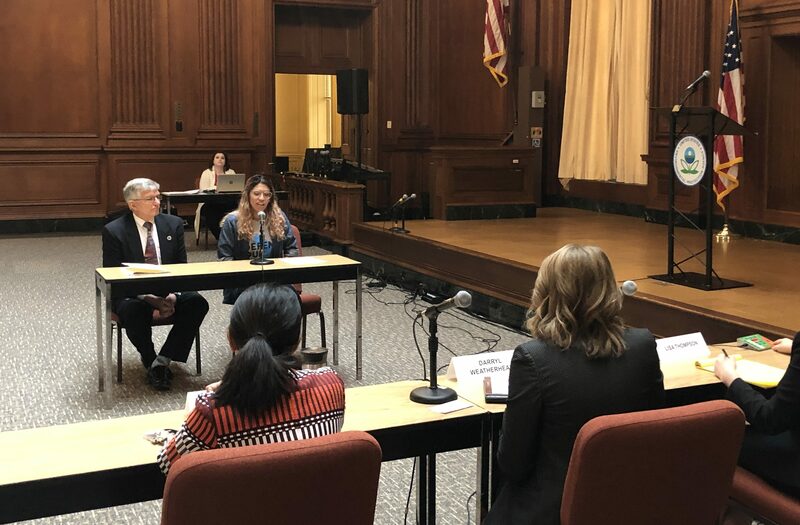 I am here today to give testimony opposing the proposed rollback of the Mercury and Air Toxic Standards (MATS) by the Trump Administration. As I’m sure you’ve heard, MATS provides a lot of benefits. The International Agency for Research on Cancer has classified outdoor air pollution as a carcinogen, citing particulate matter as one of the main components. These emissions are regulated under MATS. Mercury pollution has been linked to brain and nervous system damage and is especially detrimental to pregnant women, women of child birthing age, and children. You, the EPA estimates that the reduction of Mercury and Hazardous Air Pollutants will prevent 11,000 premature deaths, 4700 hospital visits, 130,000 asthma attacks and 5700 hospital visits annually. I am here speaking in from of you today for so many reasons. The MATS standards were the first of their kind, regulating emissions harmful to people and the environment, two things I love very much. I was raised in a Unitarian Universalist church, where I was taught to respect each person and their value and the unconnected web of life that we are a part of. I grew up climbing trees and camping with my Girl Scout troop, things I would love for my kids to be able to do one day as well, but they can’t if their environment is not a safe and healthy place to be exposed to. 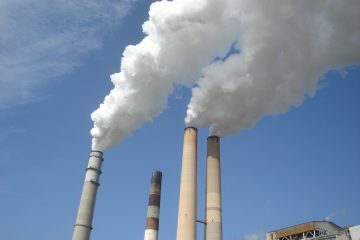 There are 600 power plants regulated by MATS, 6 of which are located in my state, Pennsylvania. About 9% of adults and 10% of children in Pennsylvania indicated that they have asthma. Two such Pennsylvanians are my best friends. With a nearly 91% reduction of Mercury emissions in PA as a result of these standards, that means there are more days when my friends can forget their inhalers at home without worrying. Not only have these standards saved lives, they’ve also saved money. Up to $90 billion is spent each year to make air quality improvements for human health and implementing MATS only costs 1/10 of that. Even private industry are against this rollback. In July, a consortium of power companies publicly urged you to keep the standards as they are with representative Brian Reils saying “EPA should leave the underlying MATS rule in place and unchanged, and should not finalize any action that would undermine the existing MATS rule.” After investing 18 billion in order to meet compliance standards, the majority of power plants now meet the standards and are producing cleaner electricity. The question of how “appropriate” these standards are was raised by new EPA Administrator Andrew Wheeler, but only two years ago he was a contracted lobbyist for Murray Energy, one of the biggest opponents of the MAT standards. If we know that people are benefiting from the MAT standards, then who is this rollback for? By approving the MATS rollback it sends the message that the EPA is more concerned about the private interests of the coal industry over the public health and safety for all Americans.